Earn up to 44,040 reward points. Key of Eb. one-piece body, polycylindrical bore, grenadilla wood, undercut toneholes, silver-plated keys, adjustable thumb rest, deluxe Naugahyde-covered wood shell case with plush interior, 41.5mm barrel. 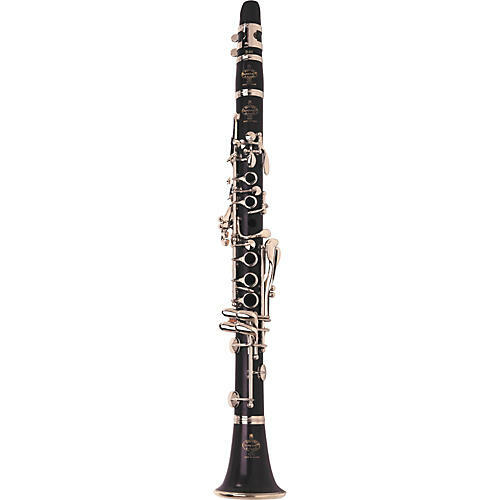 The Buffet R13 clarinet has a 40-year history of quality and craftsmanship. From wind ensembles to great symphony orchestras, it is the benchmark in clarinet manufacturing. Crafted in high-quality grenadilla wood to ensure evenness of tone and response. The R13's 3-step polycyndrical bore is noted for its dark, full sound. Most clarinetists purchasing an instrument with this level of distinction have particular preferences in terms of mouthpieces, so the Tosca Bb Clarinet is priced and shipped without one. A fine quality French-made HB ligature is included. The HB is a silver-plated metal ligature that is very easy-blowing and provides a round, centered and brilliant sound as well as a superior dtach in the upper register. NOTE: Buffet does not include a mouthpiece with this instrument. Buffet does not include a mouthpiece with this instrument. The professional standard's design and manufacturing principles applied to the Eb clarinet. Order soon.